Smartphones and fast mobile Internet access have transformed nearly all facets of life, but travel has seen some of the most dramatic changes.Gone are the days of paper maps and awkward conversations trying to figure out a foreign transit system. Today’s smartphones and apps can translate words live on screen, give real-time transportation advice, locate you anywhere in the world, act as your boarding pass, book your dinner reservation, and even help you find a cheap, last-minute hotel room. In a recent report from BI Intelligence, we explore the market for mobile travel services, dive into travel-related mobile usage, analyse how mobile travellers are attractive to brands and advertisers, and look at some of the barriers to growth in the mobile travel space, particularly the high cost of international data roaming. Tourism is, of course, huge business: Tourism is one of the world’s largest industries, responsible for some $6 trillion in direct and indirect economic impacts. 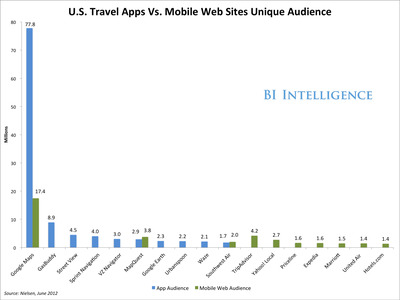 Many travel-related apps have audiences in the millions.PhoCusWright estimates that the U.S. mobile travel market could exceed $8 billion in value this year, suggesting a worldwide value larger than $10 billion. Mobile travellers are a particularly attractive audience for brands and advertisers: Recent research on mobile travellers has discovered particularities about their demographics and habits that make them quite desirable. For example, business travellers are more likely to actually book their travel on mobile (32% have so far) and consumers who use their mobile devices for travel-related services tend to have higher-than-average incomes. 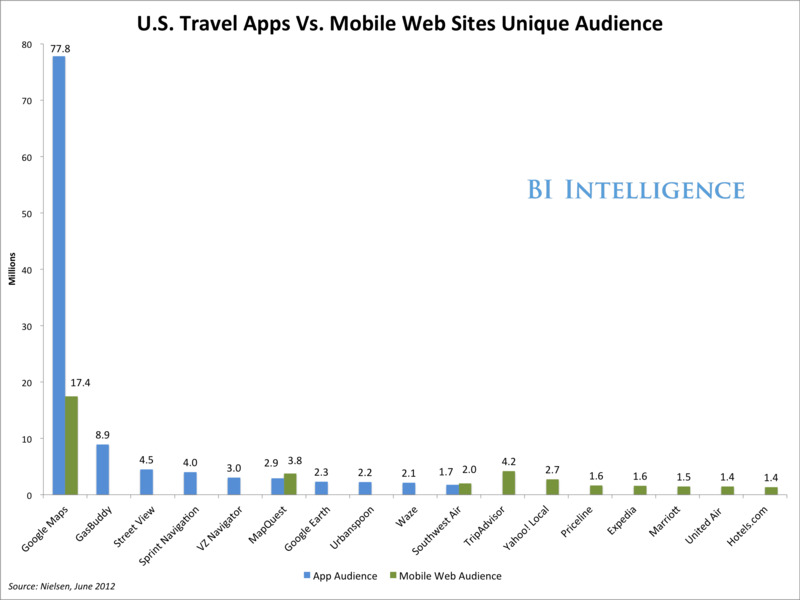 Online travel is increasingly going mobile: Not surprisingly, given the increased adoption of smartphones as travel tools, some of the largest online travel companies already report a significant percentage of their bookings via mobile. But opportunities for travel applications go beyond bookings. Advertising revenue will flow to travel apps in part because they are able to ask for and collect location data from users. Mobile is also particularly strong for last-minute hotel bookings: Hotel Tonight leverages the last-minute and spontaneous nature of many mobile-mediated travel bookings, Orbitz noted that “over 70% of reservations coming through smartphones are being done within a day of check-in,” and Expedia reported that 68% of its mobile hotel reservations are done within 24 hours of the planned stay. Mobile has clearly created a new business opportunity in hotel booking, creating a channel through which to sell rooms that otherwise would remain unoccupied and unsold. To access BI Intelligence’s full reports on The Mobile Tourist, sign up for a free trial subscription here.